This point driver is a useful framing tool whose points hold glass, artwork, and backing material securely in wooden frames. Points go in perfectly flat to avoid ripping or denting framed materials. An easy-to-load magazine holds a stack of 100 points. The lightweight design and full grip trigger comfortably fire one point at a time, making this an appropriate tool for those with limited hand strength. A spring adjustment lets you adjust firing power to the density of the wood. 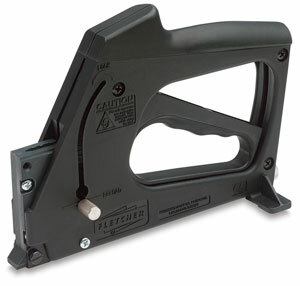 Uses 5/8" long framer's points designed specifically for framing. For household windows, use 3/8" glazier's points, which can be puttied over. A rear stabilizer keeps the point driver upright. The ergonomically designed rubber grip handle eliminates hand fatigue and increases comfort and ease of use. Points are stacked for easy handling. Order Framer's Points or Glazier's Points separately. ® Fletcher is a registered trademark.® Framemaster is a registered trademark.